Anarchic Manufacturing has its first journal publication! 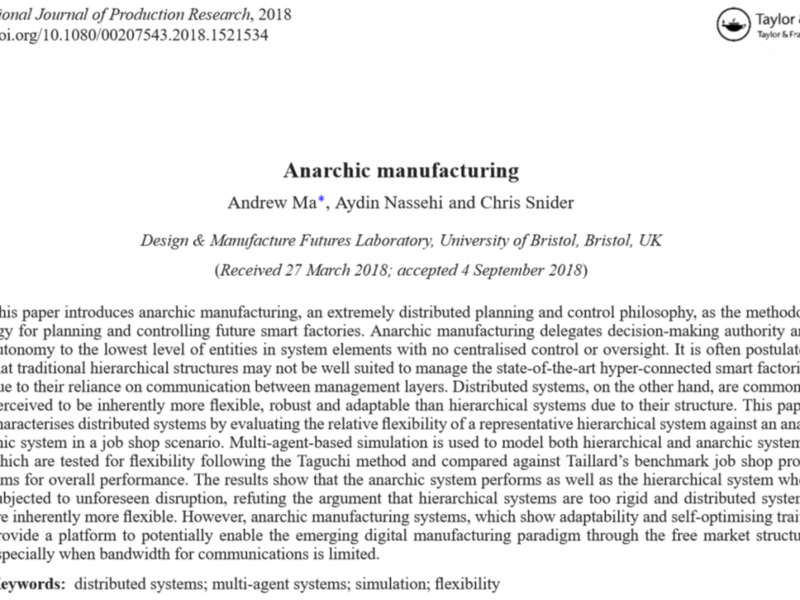 Andrew explains in-depth the mechanics of Anarchic Manufacturing and challenges the assumption that distributed systems are inherently more flexible than centralised systems in the International Journal of Production Research. Anarchic systems is going on a road show to the Cambridge International Manufacturing Symposium (CIMS 2018) at the end of September, and CIRP sponsored conference Changeable, Agile, Reconfigurable and Virtual Production (CARV 2018) in October. Andrew will be discussing how Anarchic systems perform as complexity and scale increases, and relates it to the Cloud Manufacturing environment.